Two of my favorite things, baseball and ice cream, have come together in Hudsonville Tigers Traxx. Baseball is back in the D! 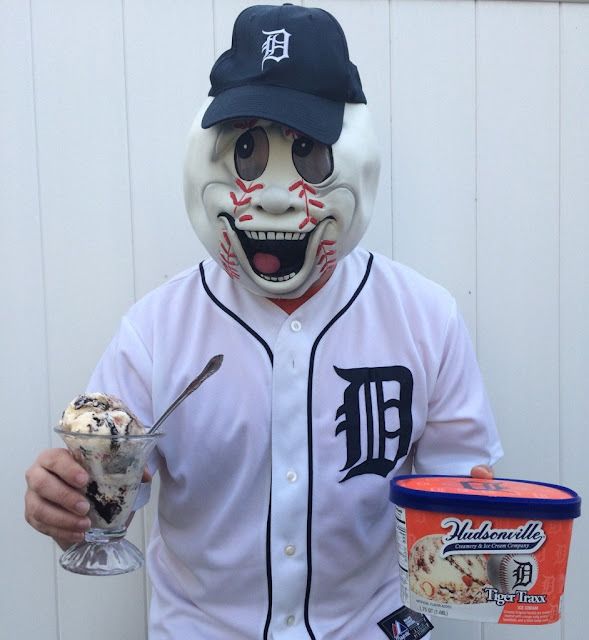 And along with the return of the Detroit Tigers playing another season of Major League Baseball at Comerica Park is Hudsonville's Tiger Traxx ice cream. 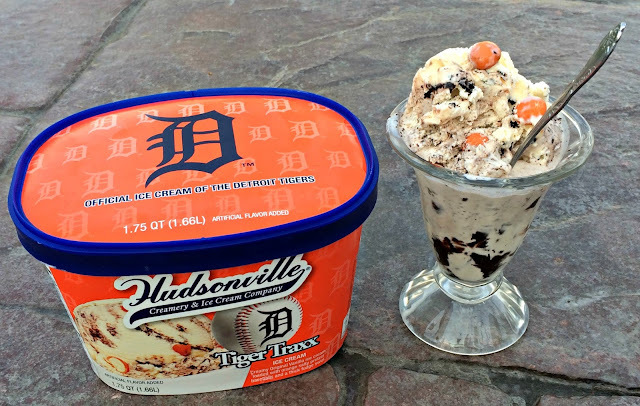 Hudsonville is the official ice cream of the Detroit Tigers and has created its limited edition Tiger Traxx variety in homage to my favorite baseball team that will be available throughout the current baseball season. It is made up of Hudsonville's original vanilla ice cream and loaded with chocolate covered salty pretzels that look like orange baseballs along with ripples of thick chocolate fudge. Oh it is so good! Perfect for a snack while watching the Tigers play on television or listening to one of their games on the radio. You can purchase Tiger Traxx anywhere Hudsonville ice cream is sold in Michigan. Plus if you are at Comerica Park for a ball game keep an eye out for the Hudsonville team providing free ice cream samples during Tigers home stands. Holland, Michigan-based Hudsonville Creamery & Ice Cream Company is known for producing artisan crafted ice cream that is available at affordable rather than gourmet prices. The company has a goal of making great products that are priced to be attainable for anyone who enjoys ice cream. They really do stand out by providing great taste and freshness in their ice cream flavors. Hudsonville is able to do this by having its manufacturing facility in close proximity to the western Michigan dairy farms that provide them with the milk for making their ice cream. In fact, Hudsonville works to get the freshest products it can for all its ingredients which really makes a positive difference. You can tell this company's commitment to creating the very best ice cream on the market with every bite or lick of its finely crafted flavors. Hudsonville Ice Cream really is delicious! Disclaimer: While Tiger Traxx does not include peanuts or tree nuts it is produced in a facility that utilizes those ingredients. Because of the risk of cross contamination I do not allow my children that have food allergies to consume any Hudsonville ice cream products whether or not the allergens are included ingredients. We do not allow any products that actually include ingredients my children are allergic to inside our home and items that may have been contaminated in production process are case-by-case determination. Contest Rules: A Geek Daddy has not been financially compensated for this endorsement or hosting the giveaway but was provided the same items being provided as a prize for personal use. A Geek Daddy is hosting the promotion as a benefit to our readers. Must be a Michigan resident over the age of 18 to participate. Winner will be randomly selected from all eligible entries. Must provide a valid email address and respond within 48 hours of being contacted providing a shipping address to accept the prize. Failure to reply within the designated time frame will forfeit the prize and a new random winner will be selected from eligible entries. The prize which consist of a manufacturer's coupon that expires on 12/31/2017 courtesy of Hudsonville Ice Cream and valid wherever their products are sold. 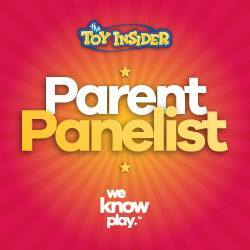 A Geek Daddy will mail the the prize to the randomly selected winner via the U.S. Postal Service. By participating in this free promotion you waive any liability of any kind against the publisher of this blog regarding this contest or the prize. Awesome post - thanks for the shoutout! 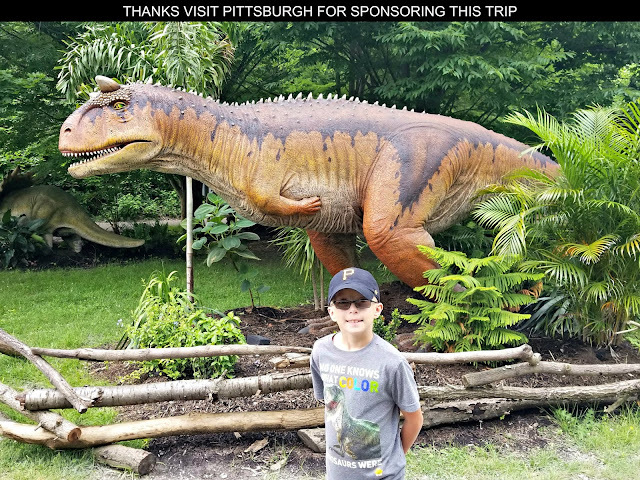 We are so happy you enjoyed our Tiger Traxx!